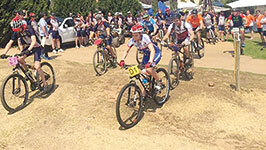 SAFPA’s annual cycle race was held on Friday 15th September at Avianto and was a huge success. Hydra-Spes was the winning team, with SMC Pneumatics second and Turnkey Hydraulics third. Congratulations also to Jaco De Beer from Tectra Automation who had the fastest recorded time. A total of 17 teams competed. A big thank you goes to the following companies who participated: Honingcraft, Hytec, SMC Pneumatics, Dosco Precision Hydraulics, Pro-Hydraulics, Hydra-Spes and Turnkey Hydraulics. A huge thank you also goes to Turnkey Hydraulics for its organisation and timekeeping.